It's growing rather faster than I can keep up with, and consequently, I'm not really keeping up with writing about the books either! However, bear with me - I just finished the two historical novels from the Marlow series that I mentioned in my Shakespeare post a little while back and I'm working on writing about them. 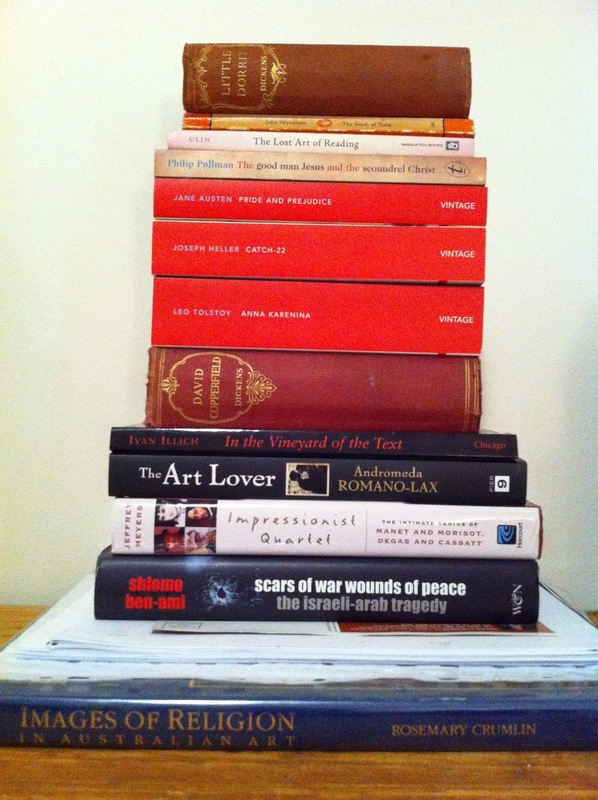 I thought the pile was worthy of a pic though, because, as will be very obvious from the titles, it is an excellent indication of my very eclectic reading style. The only thing that's missing to round it out is some children's literature - but that's because I just finished those two books!! I have to make a start on the big book at the bottom - the plastic sleeves on top of it contain photocopies and print outs of articles about Chagall and his crucifixion paintings. This is research for a paper I'm delivering at the end of this month. 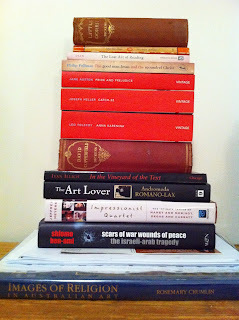 I put the Dickens on the pile this morning because they glare at me from the bookcase. I promised myself that this year I would read them. They may be on the pile a while...! Anna Karenina is there because a British girl who writes the most wonderful blog, Book Snob, is reading it for the summer and invited me, along with anyone else who cared to, to join in and read it together. Since I haven't read it since I was about 16, I thought..why not? And then had to (had to...) go buy me a copy, because I haven't the faintest idea where mine has gone. In a different conversation with her, I complimented her on her reviews of Jane Austen's books - go have a look at her site, where you'll find her reviews listed in alphabetical order by author - and mentioned I'd not read mine for a while. Went to the bookcase to pick up Pride and Prejudice and, again, missing book... Too many house moves, I say. So, I had to get me a new copy of that as well. Sundry other titles in the pile kind of fell off the shelves and I had to catch them, rather than see them crash to the floor...and so the pile grew! Trouble is, time being what it is, dealing with the TBR pile competes with the need to deal with the UFOs - those of you have other addictions than books may recognise this abbreviation, and no, it's not the expected one... It refers to 'unfinished objects' and the close relative of the TBR pile - 'the stash.' I have two large plastic crates that have been retrieved from storage, where they should never have been and they're actually two stashes. One of wool and the other of fabric. So, now there is knitting and sewing to fit in and around the reading - oh, and the little matter of working! You all feel my pain, yes? !